On Thursday, September 17th, 2015 at 04:44 hrs Shrewsbury Police responded to the CVS located on Rt. 9 for a report of an armed robbery. Upon arrival Shrewsbury Police determined the suspect had fled the scene. Police determined the lone suspect had approached the Pharmacist and passed a note stating he had a gun and demanded narcotics. 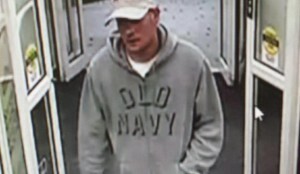 The suspect then fled the store on foot with an undetermined amount of narcotics. No one was injured as result of the robbery. The suspect is described as white male, late 20s, wearing an “Old Navy” grey hooded sweatshirt, blue jeans and white and blue baseball hat. Investigating the robbery are Detective Brian Thibodeau and Officer Daniel Cronin. Any Information, please call Detective Thibodeau at 508-841-8458.